Warren William as Julius Caesar, can you get any more majestic than that? 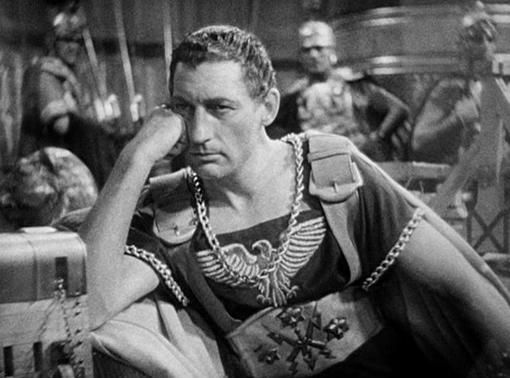 Warren wasn’t DeMille’s first choice, Adolphe Menjou and John Gilbert are variously reported as potential Caesar’s, but in his autobiography DeMille stood by his selection: “I have seen other actors portray Julius Caesar; I have never seen any that surpassed Warren William” (qtd. by Stangeland 134). 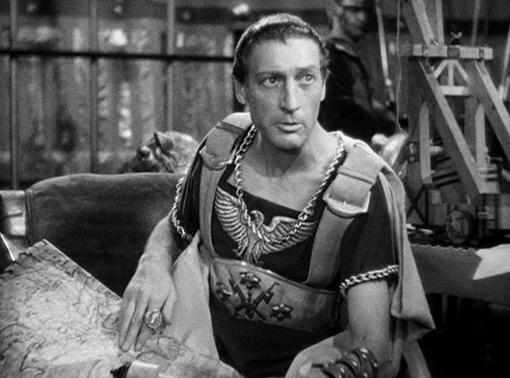 Caesar is one of the more important roles of Warren William’s career. 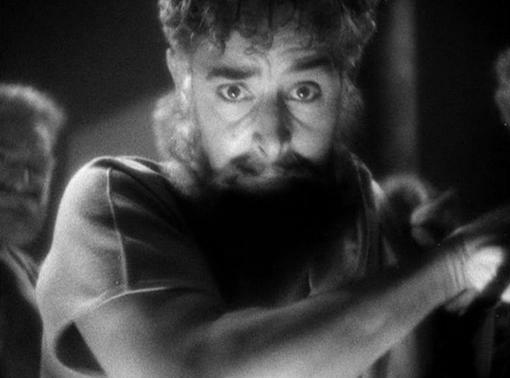 But Cleopatra is also a film where he doesn’t hang around for too long, so I knew from the start that when I eventually came around to covering this one that I’d also write a more general article about the movie for my Immortal Ephemera website. That can be found HERE. Warren William had a very active 1934 appearing in nine titles that were released that year. Included among them are his first appearance as Philo Vance in The Dragon Murder Case as well as his originating of the Perry Mason character on screen in The Case of the Howling Dog. But those were cranked out at Warner’s in between loan outs to Paramount for this film, Cleopatra, and to Universal for his subsequent release, Imitation of Life, also starring Claudette Colbert. Each of those films were released to theaters after the Production Code began to be enforced. That might be hard to imagine in Cleopatra’s case, but it was the earliest of the bunch and certainly had an easier time slipping by thanks to the historical content and DeMille’s name. The Chicago Legion of Decency granted the film B status, marking it as offensive in spots and inappropriate for children, but not forbidden to adults. So pre-code Warren William is dead by this time, but each of the four titles has merit to varying degrees and the two with Colbert are big pictures. Classics in fact, each recognized in their own time by being nominated for the Academy Award for Best Picture. That award was claimed upon yet another Colbert picture that year, It Happened One Night, which swept the four major awards. Warren, of course, was not nominated for anything. I bet Warren got a kick out of playing with these gadgets of destruction! But while the David Dwight, Paul Kroll and Kurt Anderson types are behind Warren William by decree at this point in time, there can be no doubt he’s brought quite a bit of that dying breed to the role of Julius Caesar. We first see William’s Caesar seated with paperwork on every side of him. He barely looks up to talk with Pothinos (Leonard Mudie), who’s trying to convince him that Cleopatra has fled Egypt and ceded power. Pothinos had actually personally driven her into exile, a point made Apollodorus (Irving Pichel), after returning from the desert and delivering a gift to Caesar. It turns out to be rug with the Queen of Egypt rolled up inside. William recalls his earlier business rogues when he responds coolly towards his gift, “Thanks. Give him something,” not yet aware of the treasure tucked inside. When the barely covered Queen emerges smiling and laughing at her creative entry, William sizes her up and offers, “Very good. But, eh, I’m too busy.” His head drops back into his paper work. Caesar is soon leaning into her at the door pressing for details about this treasure house of the East. “The man in you seems mightier than the General,” she observes. “Egypt, sit down,” he commands, finally giving her his total attention. He’s told that India’s gold would pay Caesar’s legions for a century. “Are your plans for India or me?” Caesar asks to which Cleopatra replies, “Both.” He eventually orders his own guards for her protection. The authors of “Royal Portraits in Hollywood” assert that “DeMille takes this shortcut–Caesar as executive–to speed the story, exploiting the anticorporate prejudices of the time” (77). That might do for those who view the William characters as strict villains, but, no surprise, I liked Caesar’s style. Still, point taken. 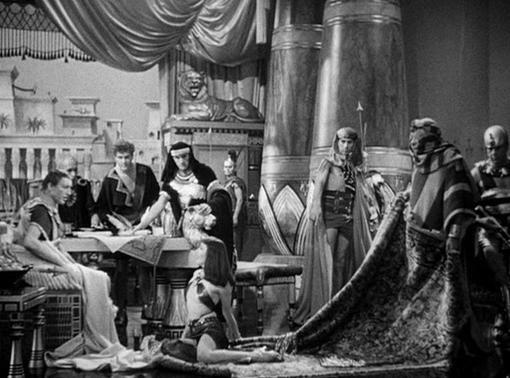 The same source in commenting upon the later scene in Caesar’s private room which ends in consummation of the Caesar and Cleopatra relationship aptly states that “He doesn’t caress or kiss her, and it takes a major suspension of disbelief to imagine that their walk up Cleopatra’s staircase, hands linked, ends in anything but a merger” (77). There’s quite a bit of pomp as Caesar returns to Rome with Cleopatra in tow. People are lining each side of the road, gossiping about the Egyptian Queen as much as they cheer Caesar. One old soothsayer (Harry Beresford), who somehow manages to gain eye level with Caesar, passes the classic warning: “Caesar. Beware the Ides of March.” Caesar, initially looking at him seriously, spits back a threat in jest, “One date’s as good as another for a funeral.” He laughs off the warning. Back home all isn’t smooth as Mark Antony (Henry Wilcoxon) confronts Caesar about his ties to Cleopatra. 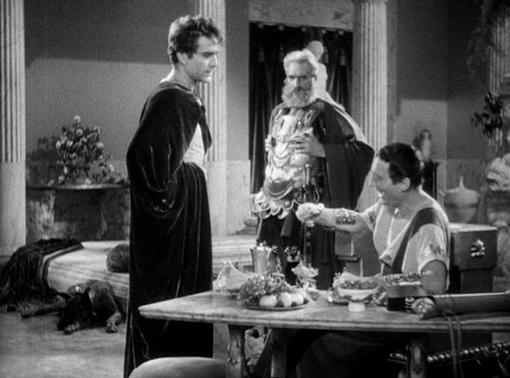 He tells him “That woman is making an Egyptian out of you,” and soon storms off mumbling that Caesar is making a fool of himself. 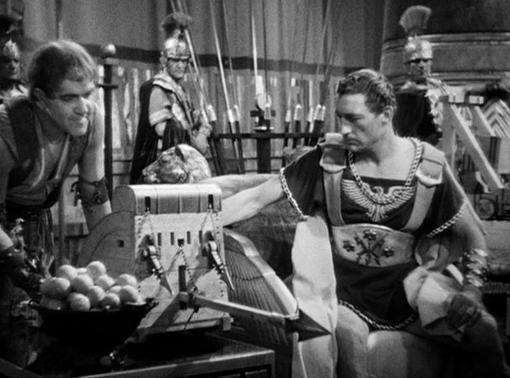 Caesar turns to his General, Enobarbus (C. Aubrey Smith), and passes a bit of compliment towards Antony saying, “I don’t know what the young man means, but he means it violently.” Definitely a line I could see William issuing about a tenacious employee from a penthouse office! 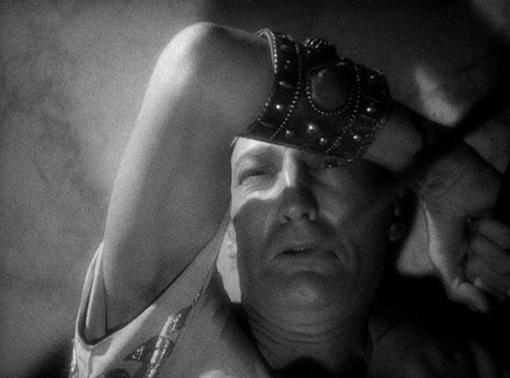 Warren William lasts about 38 minutes into Cleopatra. Despite warnings from both his wife, Calpurnia (Gertrude Michael), and his lover, Cleopatra, as well as one final word about the Ides of March from that same soothsayer on the Senate steps, Caesar strides into the Senate and is quickly confronted by a man who begs a pardon for his exiled brother. Not even looking up, Caesar replies, “Denied,” at which point the man declares him a tyrant and drives a knife down upon him. Warren William’s Caesar is granite. He’s Kurt Anderson in a toga. He’s no second banana to Colbert’s Cleopatra when they’re together either. He’s mostly dismissive of her and carries the upper hand in all of their dealings, business and personal. While Cleopatra has most definitely fallen for Caesar, she’s snapped out of her stupor after hearing of his death when Apollodorus tells her the truth: “He didn’t love you.” She lashes out at her friend with a whip before collapsing in grief, perhaps accepting the truth when doing so. William had just completed Dr. Monica prior to beginning work on Cleopatra and as mentioned earlier he’d complete both The Dragon Murder Case and The Case of the Howling Dog before beginning production on Imitation of Life with Colbert. 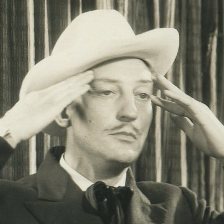 With these pictures releasing on practically a monthly schedule in the Summer and Fall of 1934 theatergoers would be able to see a lot of Warren William! Ford, Elizabeth A. and Deborah C. Mitchell. Royal Portraits in Hollywood: Filming the Lives of Queens . Lexington: The University Press of Kentucky, 2009. Stangeland, John. Warren William: Magnificent Scoundrel of Pre-Code Hollywood . Jefferson, NC: McFarland & Company, Inc., 2011. You are right about William playing Julius Caesar well. I often forget it was William who was in the role. He and Colbert had good chemistry. I’ve had my nose so deep into his later Lone Wolf pictures lately that his Caesar was almost jarring by comparison. I loved the bit when he’s playing around with those war toys in his first scene, the spear catapults and those odds and ends. It brought two things to mind: Warren as inventor, obviously, and I also think it’s a twin scene to Kurt Anderson’s playing around with the toys at his desk in Employees’ Entrance (there’s that apostrophe again!). Of course, Menjou would have had to shave his upper lip as well. As you mentioned elsewhere in the comments about Warren playing the type of parts an aging Louis Calhern wound up with, I see the same with Menjou. I don’t think Adolphe is that far apart from Warren. But early on, no, I agree with you, can’t see Menjou as Caesar. Oh, I’ve imagined it, John, I’ve imagined it!